Years and years ago I was at a conference and the presenter was talking about creative ways to store games and activities. She described something similar to this method. My teaching partner and I did some IKEA shopping to see what we could find and made it our own. 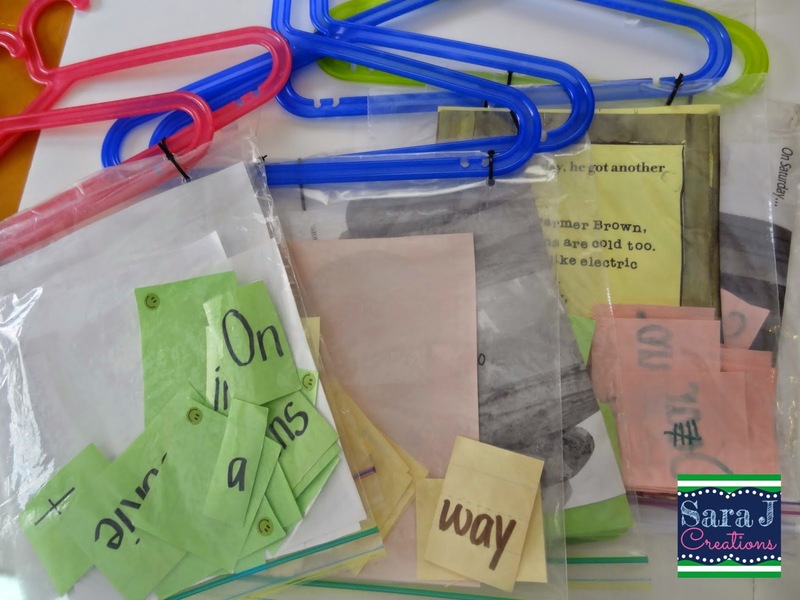 This was the perfect solution for storing flat games and activities such as cut up sentences. It was the right height so that our second graders could reach it by themselves. It would be perfect for a lot of the activities you find on TpT that are printed out and generally flat. Take the plastic bag and turn it upside down. Reinforce the bottom of the bag with the packaging tape. I usually just take a piece and fold it over both sides of the bag. Then punch two holes where you taped. It doesn’t really matter how far apart they are. 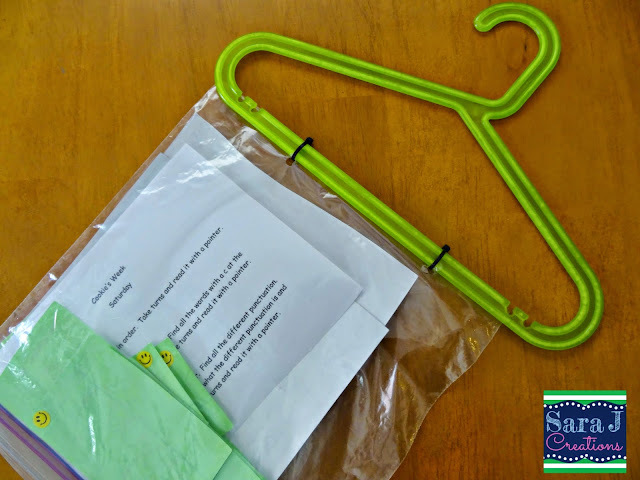 Use the zip ties to attach the bag to the hanger. Cut off the extra zip tie and you are ready to fill your bags. The 2 gallon bags are harder to find but come in handy for bigger games that don’t fit in a regular gallon bag. Hanging games upside down can definitely come with problems. Often if we had little pieces we would put those in a smaller baggie. Then if it fell out, it was at least contained in the baggie. We worked with our kiddos on how to close the bags. Again, this is where the zippered bags are easier than the yellow and blue make green ones. This can take up a decent amount of space depending on the size of your clothes rack but we figured out that we could store our math manipulatives underneath it so there was no wasted space. I had one of those shelves you see at Target that has different size plastic bins in a variety of sizes that go on the three shelves. 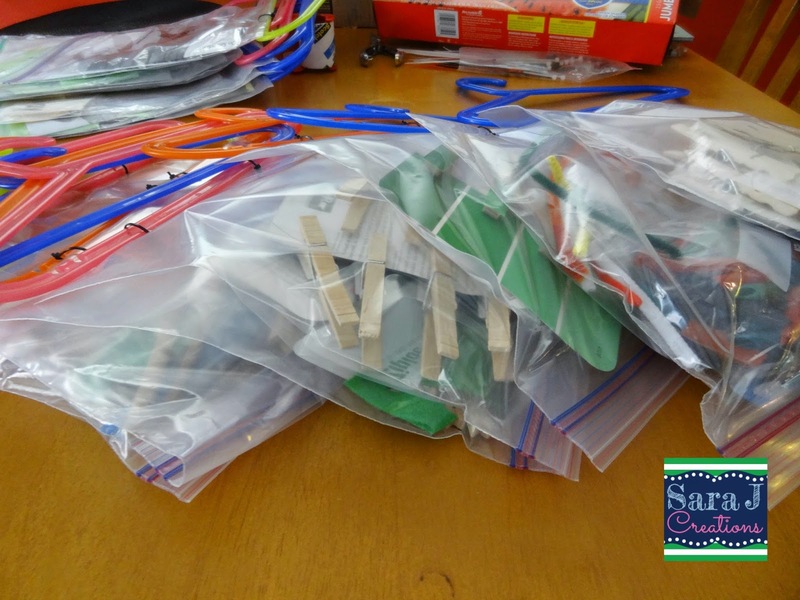 It is designed for toys but we put math manipulatives in it and slid it under the hanging bags. I got my clothes rack back out and made some new bags at home for K. Right before M was born I made a bunch of busy bags. Some were things K could do alone and some were activities she needed some help with. I figured I would need some new activities to entertain her once the baby was born but also some activities she could work on next to me while I fed the baby. I hung these up the same way I did in the classroom and put it in my dining room. Her busy bag activities are a little bulkier than cut up sentences but they still fit in the ziploc bags. Unlike my second graders, K can’t reach these activities on her own and I like it that way. She needs an adult to help her get the bag she wants. Some of her busy bag activities were too bulky for a Ziploc bag so I bought tote bags from Michaels and just loop them over the hangers. Works the same way! Thanks! I've been trying to use the plastic bins and other things from my classroom that are stored in my basement and fight the urge to buy brand new organization tools for my girls. This worked out perfect for our busy bags!